Gross cystic disease fluid protein (mouse monoclonal) is a secretion from breast composed of several glycoproteins, including GCDFP-15. It is considered to be a marker of apocrine differentiation. 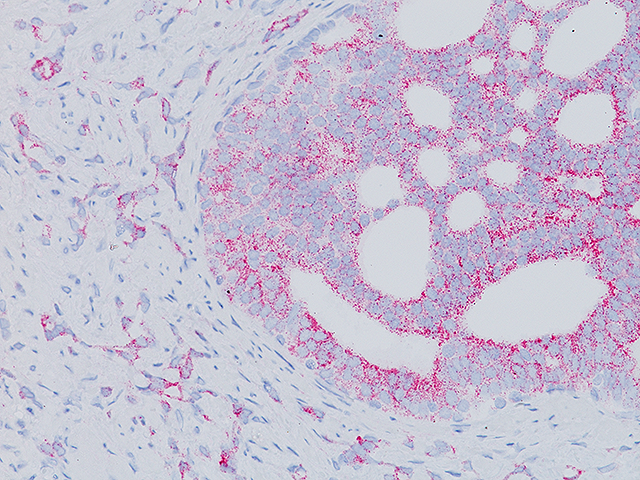 Numerous studies have shown GCDFP-15 (BRST -2) to be a specific marker for breast cancer in formalin-fixed paraffin-embedded tissues and in cytologic preparation (fine needle aspirates). Other types of tissues that express GCDFP-15 are axillary sweat glands and submandibular salivary glands. 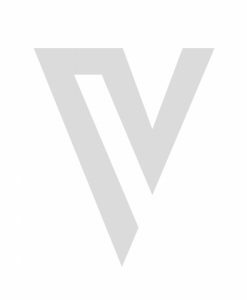 Mammaglobin (rabbit monoclonal), a mammary-specific member of the uteroglobin family, is known to be overexpressed in human breast cancer. Studies suggest that mammaglobin is one of the first relatively mammary-specific and mammary-sensitive markers. 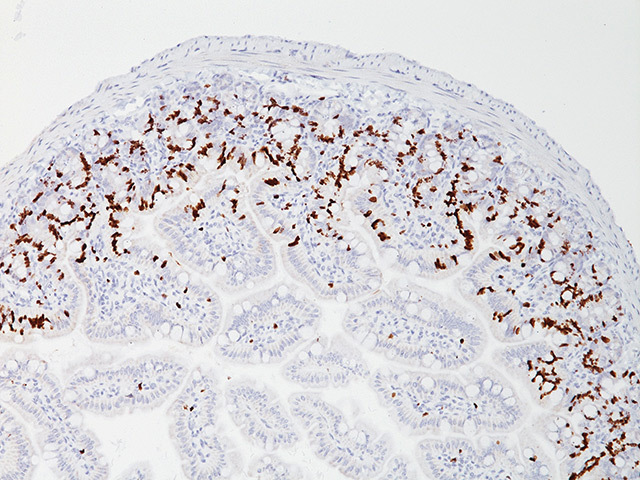 In normal breast tissue, mammaglobin labels breast ductal and lobular epithelial cells. 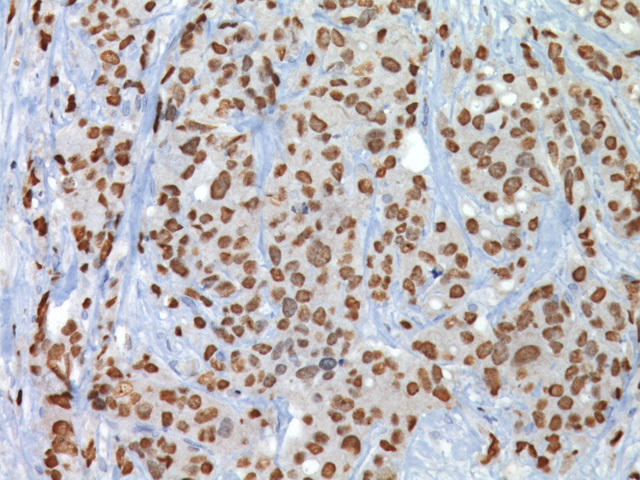 However, mammaglobin is expressed in a higher percentage of lobular carcinoma versus ductal cell carcnimoma. Studies have also shown that mammaglobin was not altered at the metastatic lymph node site. 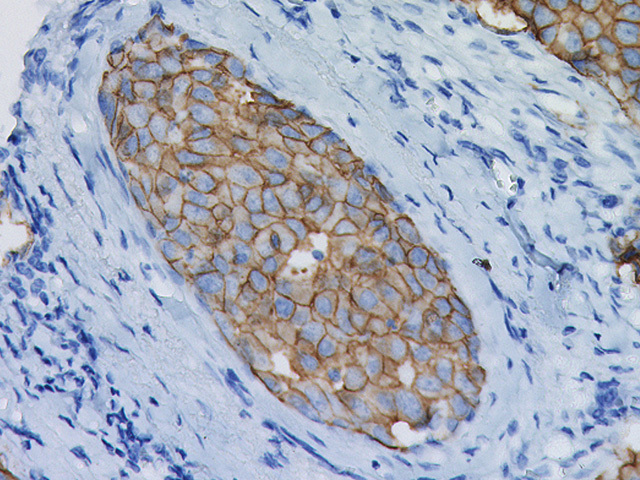 Mammaglobin has been shown to be expressed in non-breast cancer sites such as endometroid carcinomas (39%), endocervical adenocarcinoma in situ (45%), sweat gland carcinomas (40%), salivary gland carcinoma (20%), melanoma (6%) and is also found in a small percentage of ovarian carcinomas and pancreatic adenocarcinomas. Mammaglobin is expressed in 50-60% of metastatic breast cancers while GCDFP-15 is expressed in approximately 20-25%. 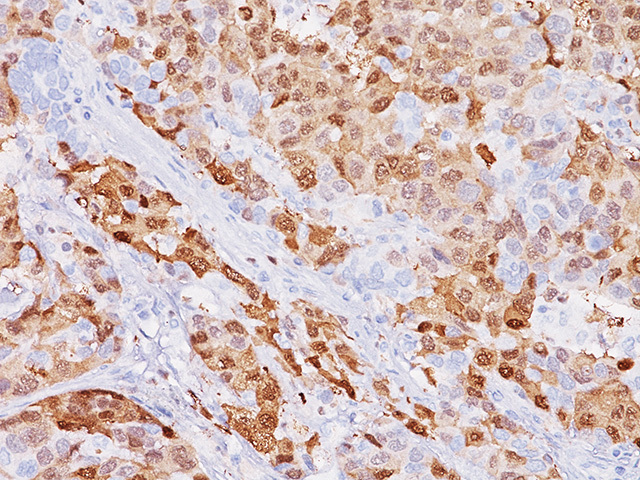 Mammaglobin is a more sensitive marker than GCDFP-15 for breast carcinoma; however, it lacks the specificity of GCDFP-15. 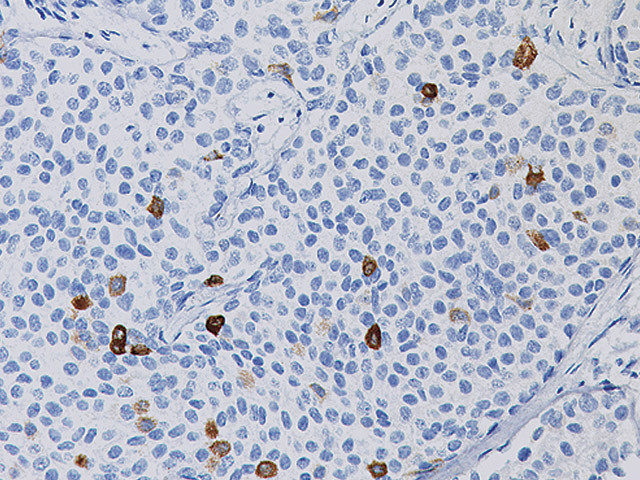 The combination of GCDFP-15 and Mammaglobin and other markers may help to establish the correct interpretation of metastatic breast carcinoma. 1. Bhargava R, Beriwal S, Dabbs DJ. 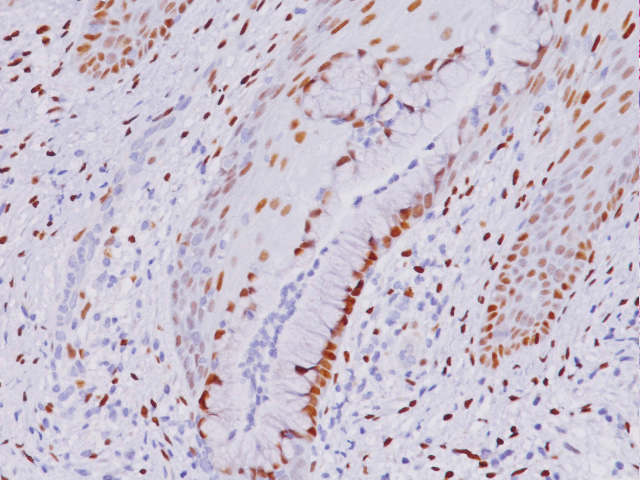 Mammaglobin vs GCDFP-15: An Immunohistologic Validation Survey for Sensitivity and Specificity. Am J Clin Pathol. 2007 Jan; 127(1):1-11. 2. Wick MR, Lillemoe TJ, Copland GT, Swanson PE, Manivel JC, Kiang DT. 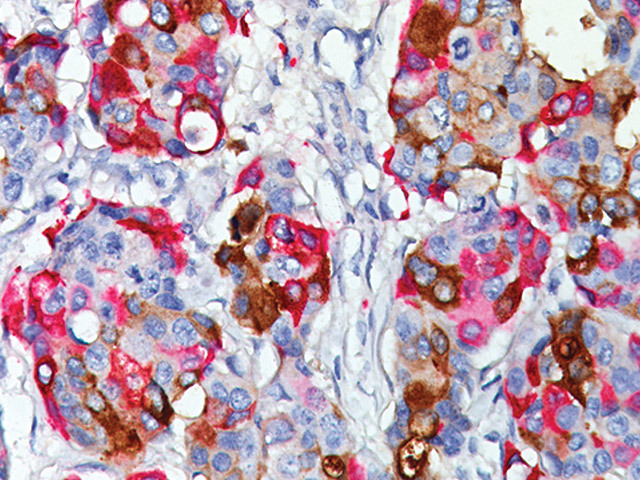 Gross cystic disease fluid protein-15 as a marker for breast cancer: immunohistochemical analysis of 690 human neoplasms and comparison with alpha-lactalbumin Hum Pathol 1989 Mar; 20(3):281-7. 3. Han JH, Kang Y, Shin HC, Kim HS, Kang YM, Kim YB, Oh SY. 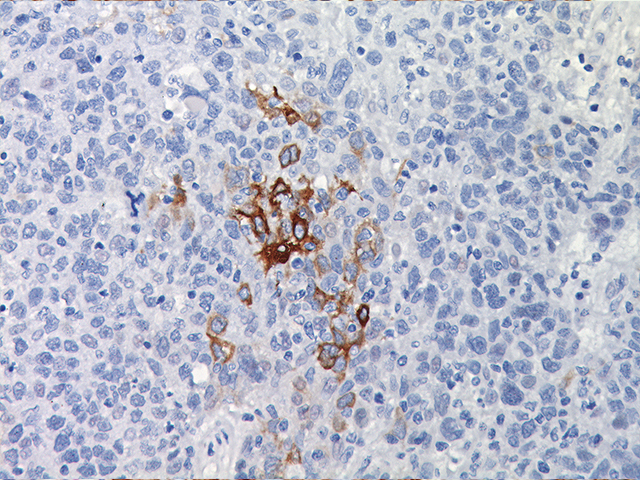 Mammaglobin expression in lymph nodes is an important marker of metastatic breast carcinoma. (Polyclonal) Arch Pathol Lab Med. 2003 Oct; 127(10):1330-4. 5. National Committee for Clinical Laboratory Standards (NCCLS). Protection of laboratory workers from infectious diseases transmitted by blood and tissue; proposed guideline. Villanova, PA 1991; 7(9). Order code M29-P.